Using the Incometer V110, you can determine exact measurements for cylinder deformation and wear. You operate the form measuring system using our Incowin control software. The Incometer V110 is a high-precision measuring system for performing form measurements in cylinder bores. It was developed specifically for engines with difficult installation requirements and allows you obtain important measured data for extremely flat V engines with great speed and reliability. This data is required for the analytical examination of the cylinder/piston configuration in engine development. The system measures and analyzes the impact of cylinder heads and cylinder head gaskets on cylinder deformation. You can also conduct long-term tests to monitor cylinder distortion and wear rates under the influence of temperature. The Incometer V110 is characterized by its impressive performance as well as its highly robust and compact design. Thanks to the clamping mechanism, you can easily adapt the system to different cylinder dimensions. This enables flexible and mobile deployment of the incometer V110both in development and testing. Accessories such as measuring tips and clamping jaws are easily replaced, allowing you to use the device for varying diameters. With its clear and intuitive menu guidance, the Incowin control and evaluation software enables quick and simple operation of the form measuring system. Since measurement routines have already been predefined, you merely need to enter or select the relevant values. This eliminates the need for elaborate programming and allows you start your measurement tasks without delay. Rapid and precise: Exact determination of measured data with very short measuring times. Flexible and mobile application: In research and development. Compact and powerful: Small, robust probe is almost as powerful as a stationary form measuring machine. Time-saving: Self-adjustment negates need for elaborate workpiece alignment. Simple: Intuitive operation of the measuring system using the INCOWIN software. 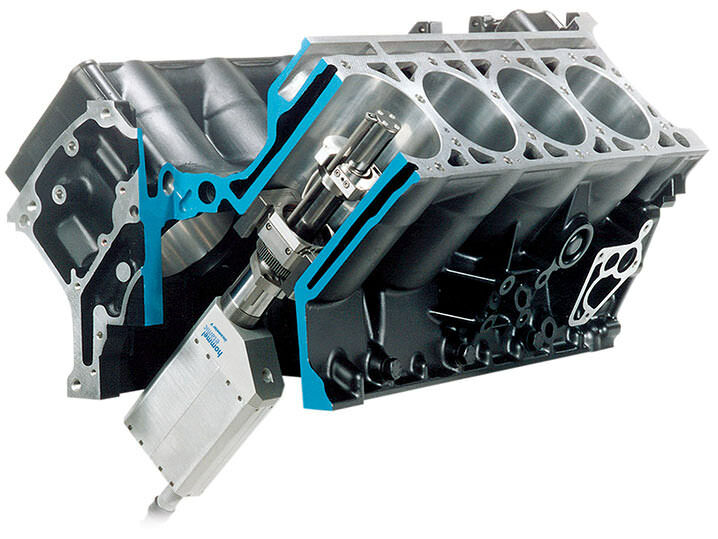 Automotive industry: Form measurement in cylinder bores of extremely flat V engines.